If your car or van is less than 5 years old, then it is still likely to be within warranty. 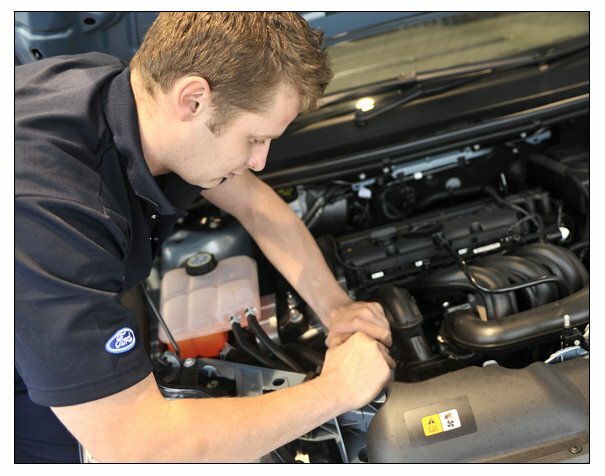 To ensure it gets the best attention possible, we offer the Ford Blue Service carried out by our highly skilled technicians it who help to keep your Ford in top condition and safe to drive, while also maintaining its resale value. Of course, Ford Original Parts are used throughout this service and all repairs come with a warranty. Plus, when you avail of the Ford Blue Service at Cavanaghs of Charleville, as well as maintaining your Warranty you will also extend your Roadside Assistance cover for a further year. For all Service Bookings please use our online booking form or call 1850 500 304. For all Ford cars 5 years or older, please see our Motorcraft 5+ Service). Free Roadside Assistance – One year of Pan-European Roadside Assistance comes free with this service. Check for Software Updates and Product Recalls – our workshop software is linked with the main Ford software so that any outstanding issues that may exist on your car are automatically applied. Updating of Digital Service Record (digital service history of your car) and stamping of Service History Book to preserve your car’s value. If you would like to know about the Ford Blue Service, please follow this link on the Ford Ireland website (Ford Blue Service) or contact our Service Hotline on 1850 500304 and our Advisors will be only too happy to assist you . ** Xenon, Internal and LED Bulbs are excluded. If your vehicle is on a longer than average service interval (20,000kms is average) this may mean that a Service will not be due until after 12 months is passed. In this instance, Cavanaghs of Charleville recommends that all vehicles undergo a ‘Mid Interval Inspection’ which is a complete Vehicle Health Check at a cost of just €25.00. We feel that this allows us to pro-actively manage the performance of the vehicle ensure that the car is running at its best right up until the Service interval is reached.